When water flows over a dam, it looses some of its useful energy. Solid wood burns to become ash. Converting the useful energy to do work, some of the energy is lost in heat. The decrease in energy over time is referred to as Entropy. First of all, Entropy is a concept that everything in the universe tends towards disorder or chaos. For example, all living things age and die, they don’t get younger. Mechanical things tend to wear out and break down. Bricks are not naturally stacked up nicely or become part of a building unless someone has put a lot of effort into making it. So, chaos or disorder is more probable in the universe than order. Entropy Change from Viziscience on Vimeo. Thermodynamics is just a branch of physics that studies heat and other forms of energy (mechanical, electrical or chemical) and their relationships between each other. The First Law of Thermodynamics states that matter/energy cannot be created or destroyed. The Second Law of Thermodynamics states that matter/energy gradually deteriorates over time. While quantity remains the same (first law), the quality of matter/energy deteriorates. As energy is used for productivity – such as grow new cells or repair tissues, useful energy is converted to unusable energy. The Second Law of Thermodynamics state that once Energy is changed from usable form to unusable form, it cannot be recovered. And Entropy is a measure of that unusable energy. When unusable energy increases, it means Entropy also increases. Energy transfer is studied in three types of system. It is important to understand what they are. 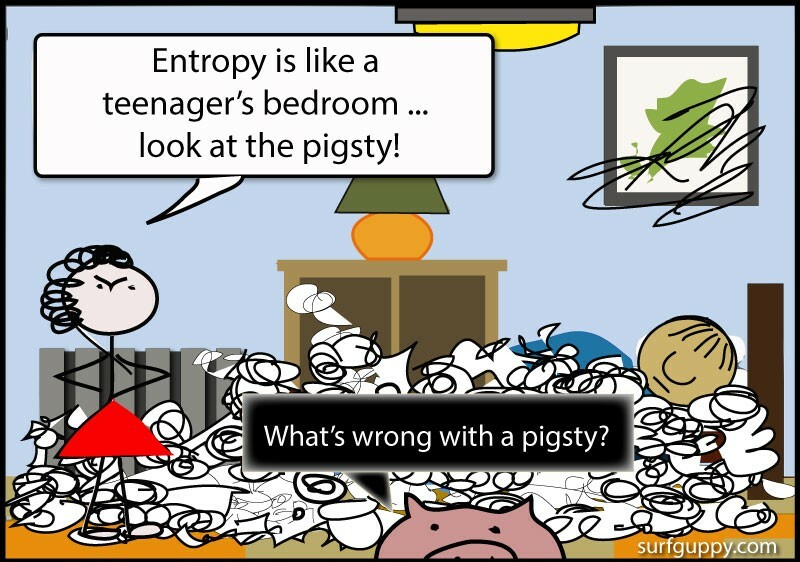 There are quite a few variations for the definition of Entropy. One of the most misleading idea is “Entropy is a measure of disorder”. One tends to think about patterns when the word “disorder” or “randomness” is used rather than thermodynamics. As described earlier, how do you measure disorder? Is it by how far molecules are apart from each other? Is it by arrangement or pattern of molecules, particles or objects? Absolutely not! If you have a pack of cards randomly placed on a table next to a pack of cards neatly stacked up on the table, you may say one is more random than the other. 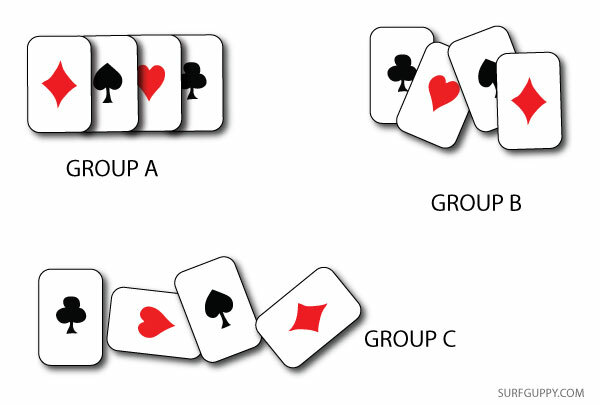 As you can see below, group B & C cards are more randomly placed but the properties of the cards have not changed. All three groups still have the same arrangement of molecules more or less and they have not undergone any heat or energy redistribution. So change in Entropy has not taken place in all three groups of cards regardless of how they are arranged. So, what is a good definition for Entropy? You have to think in terms of heat or energy, not randomness. If you decide to burn one set of cards, now you’re talking! The set of cards that you burn has undergone an entropy change. First you apply heat by means of lighting a match to it. The cards then catch fire and burn really hot. The cards made of paper have potential chemical energy. Burning the cards releases the potential energy. Heat is dispersed and transferred to the atmosphere. Entropy has increased in burning the cards. And overall, the burning adds to the increase in Entropy in the universe slightly. So, the more people burn cards, the more entropy is added to the universe! Entropy is a measure of the quantity of heat energy dispersal during a physical or chemical process happening at a constant or specific temperature. When energy is dispersed, useful energy is turned into unusable energy. So if you burn a pack of cards, the bonds in the molecules of cards are broken and at same time heat escape into the atmosphere. Eventually, no more burning takes place. 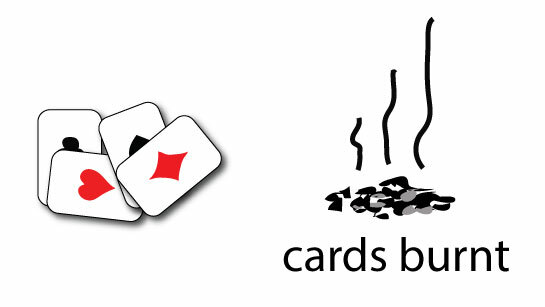 The cards become ashes and the temperature of the ashes become the same temperature as the atmosphere. There’s no more heat in the system of burning cards as the smouldering dies down everything cools down. Since no differential temperature exists between the cards and surrounding air, no more energy movement can take place at all. Heat can only move from hot to cold, if everything is at the same temperature, then there’s no movement of energy. You can say work is done – completed! And equilibrium is reached and you won’t need to call the fireman out to kill the fire. You can see now that usable energy decreases, unusable energy increases. 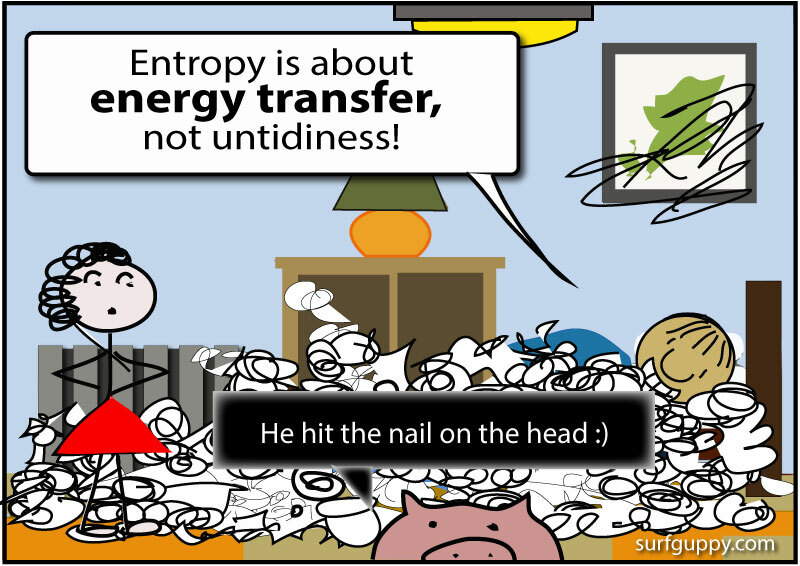 The amount of unusable energy generated as a result of the process is related to Entropy. So Entropy increases when the amount of unusable energy increases. If you burn a stack of cards, no matter how long you wait, the chances of the cards becoming “unburn” will never ever happen. Energy cannot flow back into the ashes to make the cards whole again by a natural process. The probability to reverse the process by itself is zero. 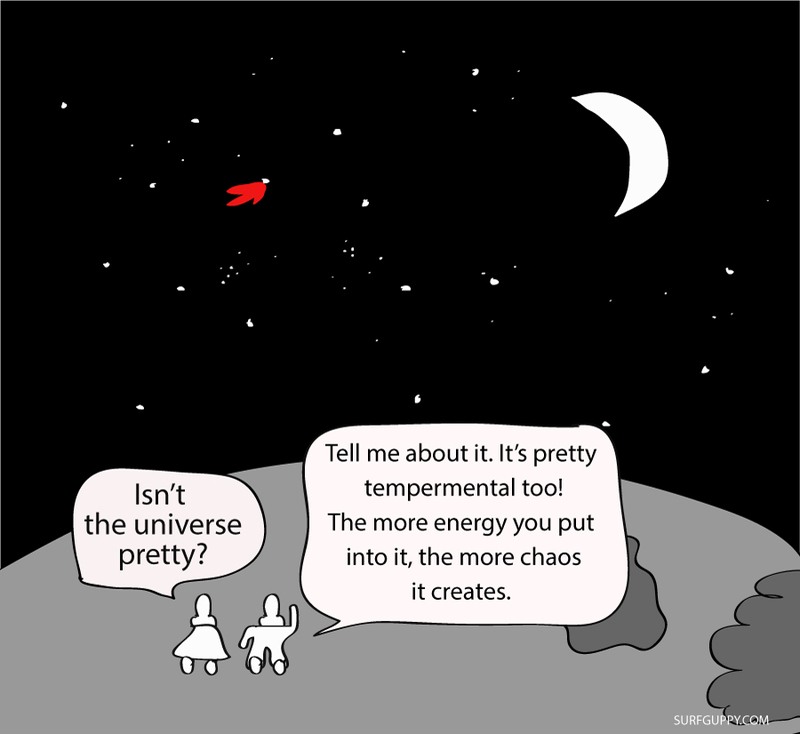 The Second Law of Thermodynamics say that Entropy in the universe always increases. This is true if the universe is an isolated system that you cannot put any more energy into it. It starts off with a certain amount of energy and all the usable energy is converted into unusable form eventually as a result of decay. So even if you don’t burn the cards, over time, after many years, the cards will eventually disintegrate. So Entropy increases over time. In that sense, naturally everything tends towards chaos, but not chaos in the sense of arrangement or patterns of things but chaos in the breaking down and degeneration of matter. And energy converted from usable to unusable form. And you can understand why scientists say time cannot go backwards, it has to proceed forward! The textbook defines Entropy as the measure of the amount of “disorder” in a system. Remember the discussion above says that disorder doesn’t mean the pattern or arrangement of particles. But sometimes the arrangement of particles can tell you about Entropy. How do you measure entropy? Using this equation it is possible to measure entropy changes using a calorimeter. The units of entropy are J/K. WHAT IS THE LAW OF DISORDER? The law of disorder states that the more energy you feed into any part of the universe (for instance your cup of water by heating it), the more rapidly disorder occurs in that part of the universe (the molecules in the cup of water get excited from the heating and will move faster and create more chaos). Everything tends to move towards disorder or randomness. How do you predict if a chemical or physical change is going towards orderliness or randomness? There are three principals you can apply. 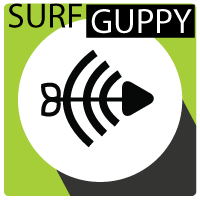 Entropy becomes greater changing from solid to liquid, and liquid to gas. In solids, the molecules are arranged more orderly. The molecules in liquids are more random than in in solids. In gas, the molecules are moving around very randomly. 2) Changing from a solute to an aqueous solution. 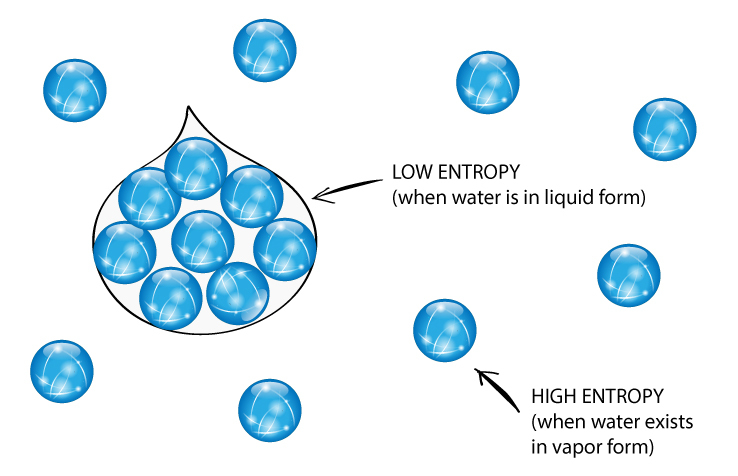 Entropy increases when you dissolve a solid in a liquid, or combining a liquid into a solution with other solvent. It increases in entropy because now the solute particle can move more freely and randomly in a solution. Example below shows the product number of particles is greater than the reaction particles. The more particles (especially in a gaseous state) the more random movement of particles. When a substance changes from solid to liquid or liquid to gas, entropy increases as the molecules become more random. When a gas becomes a solvent, the entropy decreases. Gas is more free to move in the air than in liquid. If the product number of particles is greater than reactant number of particles, then entropy increases.